A co-op in Gramercy recently hit the market for $4.75 million and comes with one of New York City’s most priceless amenities: an exclusive key to the park. 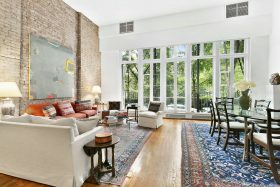 Located at 48 Gramercy Park North, this one-bedroom home measures 1,765 square feet and features 14-foot high ceilings and exposed brick. With south-facing views overlooking the park, and a 21-foot-long veranda, this apartment should not be missed.